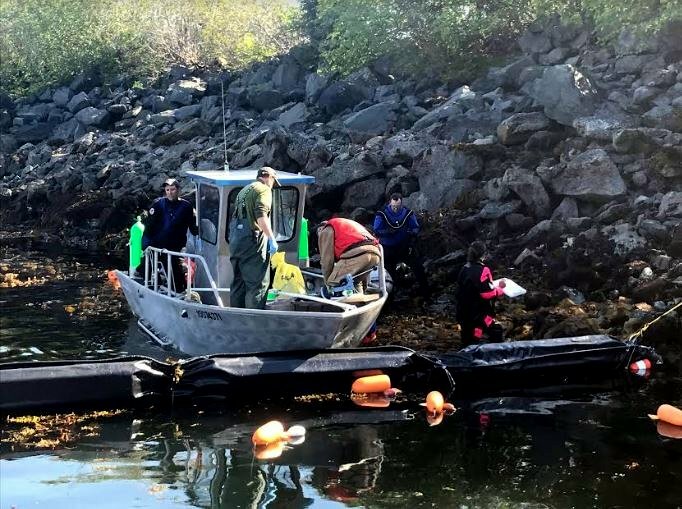 The state’s campaign against an invasive marine species near Sitka is going on hold, while researchers crunch their data and look for funding to pursue all-out eradication. Note: Tammy Davis, Katy Newcomer, and Ian Davidson will be giving a presentation on their research Monday, August 27, beginning at 5:30 p.m. in the Sitka Sound Science Center. In subsequent years, researchers have worked to refine their methods, to take out as much D.vex as possible, while leaving the rest of the ocean environment unharmed. Ian Davidson, with the Smithsonian Environmental Research Center, has been on the project since the beginning. He says the team has finally dialed in a technique for killing D. vex, using a floating barrier called a “turbidity curtain,” and a biocide familiar to us all: swimming pool chlorine. The Smithsonian team is working with the Alaska Department of Fish & Game aboard the state research vessel Kestrel, which is prominent around Sitka in March, when it serves as the management platform for the Sac Roe Herring fishery. Their target area is Whiting Harbor, just across Sitka’s airport runway, which around 20 years ago was home to a now-defunct oyster farm. About 3,500 feet of the Whiting Harbor shoreline was contaminated by D.vex from the farm, and although all farm structures have long since been removed, the D.vex remains. It’s growth has been slow, and that’s why we have a chance to stop it. Katy Newcomer is Davidson’s colleague from the Smithsonian. 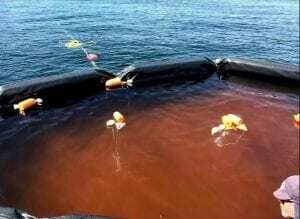 But it’s still no simple task to deploy a turbidity curtain — accounting for Sitka’s tides and currents. The team opted for heavy, black pvc plastic, rigged to a complicated system of floats. Newcomer and Davidson say it’s difficult to work with, but effective. Newcomer — So we’ve enclosed a column of water, either inside or against the shoreline, and the space that it covers depends on how well we set the curtain itself. It can be as big five meters by five meters, or eight meters by eight meters. It kind of varies depending on how well we get it to stretch it’s full length. Davidson — It’s very robust, but for what we got in robustness, it’s not as nimble as we would have liked. The project is being spearheaded by ADF&G’s Invasive Species coordinator Tammy Davis, in partnership with the Bureau of Land Management, which owns the intertidal area around Whiting Harbor. So far, Davis is relieved that D.vex remains contained in Whiting. 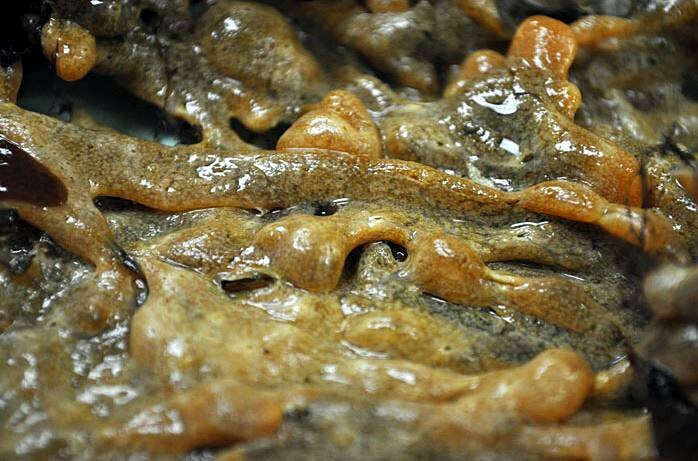 The tunicate has turned large areas off of the US Atlantic coast into marine deserts. The state has installed buoys in the area alerting boaters to the hazard, but there is always a danger D.vex could spread. To prevent that from happening, Davis would like to consider full eradication. But like everything in state government at the moment, it’s complicated. The top priority of her office is invasive species prevention — eradication is really a different kind of challenge altogether, as is raising the money to do it. The Smithsonian’s Davidson says that is phase 3.